Contact us and make your reservation online with the masseurs you want, do not forget to indicate the type of massage you want and the date. To satisfy all your needs we perform Incall and also Outcal services for those who seek to relax within the comfort of your home or hotel. We open everyday from 10.00-24.30 am. 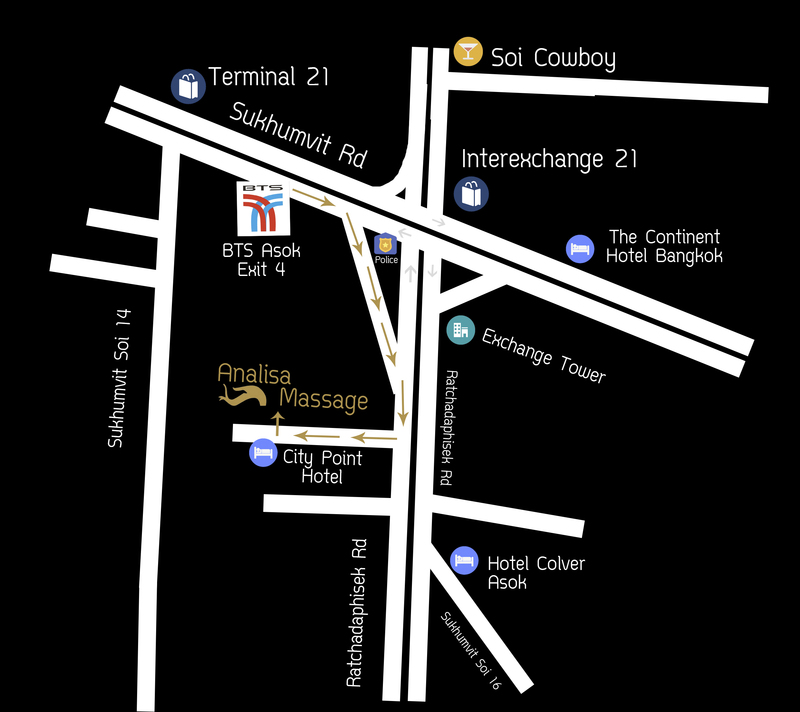 Analisa &Tantra massage Bangkok is located under the name of Analisa Massage, 5 minutes walk from the BTS of Asok in the exit No.4 on you left side then step down and turn right. walk a long the road the same way to Connex Hotel. After Connex hotel then turn right. Analisa massage on your right side that you can see from the road. We are opposite Citypoint hotel. Tantra massage Bangkok is located under the name of Analisa Massage, 5 minutes walk from the BTS of Asok in the exit No.4 The Tantra Massage services are totally different from those provided by your sister store, Analisa! Come visit us! If you have any questions on how to get there you can call us by phone, or use the breast of Google maps. Or the signs at the beginning of the Soi will indicate where we are! SEE YOU THERE!